"Persuade a client to buy what you're selling. Energize the boss to act on your ideas. Rally the staff to see themselves as members of your team. No matter what the situation, success in business depends on having effective relationships. 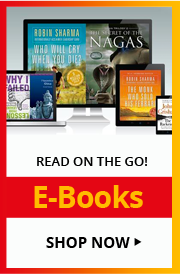 Nicholas Boothman's first book, How to Make People Like You in 90 Seconds or Less, is ""Dale Carnegie for a rushed era"" (The New York Times). It has 87,000 copies in print, reprints continuously, and remains in hardcover. Now Boothman brings his innovative system of forging instant connections to the workplace. This is a book that deals not only with the importance of making a great first impression, but also with ongoing business relationships. 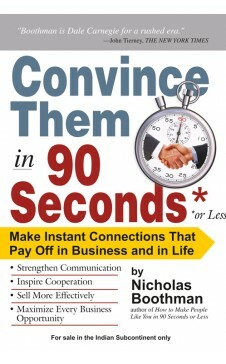 Based on the breakthrough idea of ""rapport by design,"" HOW TO CONNECT IN BUSINESS IN 90 SECONDS OR LESS shows how to mine the potential in every situation, from an accidental meeting at the water cooler, to a brainstorming session, to a formal presentation before a large group. It digs into the fundamentals of Persuasion, Purpose, and Personality to get to the basis of self-confidence and effective communication. It covers the traditional business concerns of team building, e-mail and phone relationships, and managing up and managing down. And throughout, creative exercises make the ideas come alive, including ""Evaporating Fear,"" ""Making Your Own Good Luck,"" ""Creating Your Ten-Second Commercial,"" and ""Packaging Your Personality."""